Anyways, on the way to the Marine Drive bike path along the Columbia, I crossed a branch of the Columbia's old backwater channel, the Columbia Slough. * But before I crossed the bridge, I noticed a gated service road that paralleled this channel of the slough. 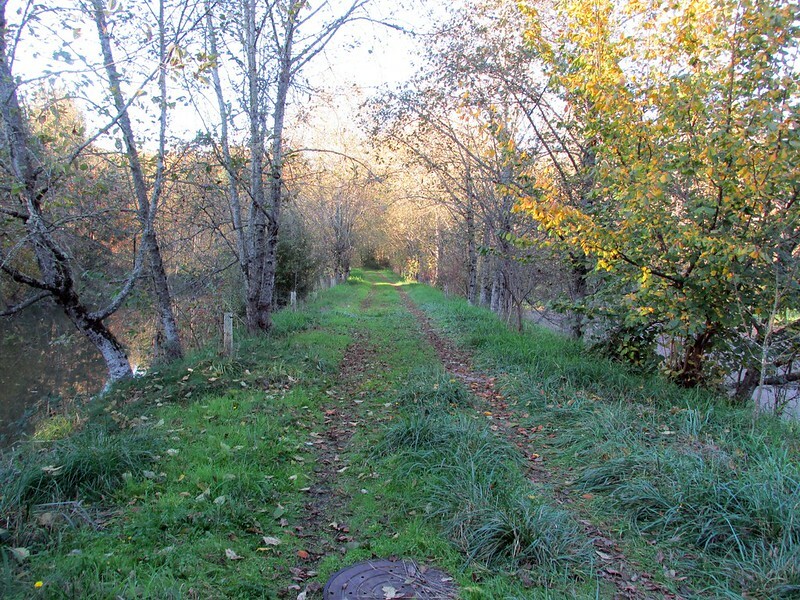 I was going to ride another slough-side trail further west, but why not explore this one and see where it goes? So what if the sign says "No Trespassing?" Immediately I felt a change from busy four lane NE Airport Way, the road I was on, to a quieter, more bucolic setting. This is the old floodplain of the Columbia that floods no more due to the extensive (and excessive) diking down here. But the flavor of the area is decidedly riparian, and surprisingly bucolic, even as I pass pump stations and the loud hum of industry is omnipresent, just a few hundred metres away. 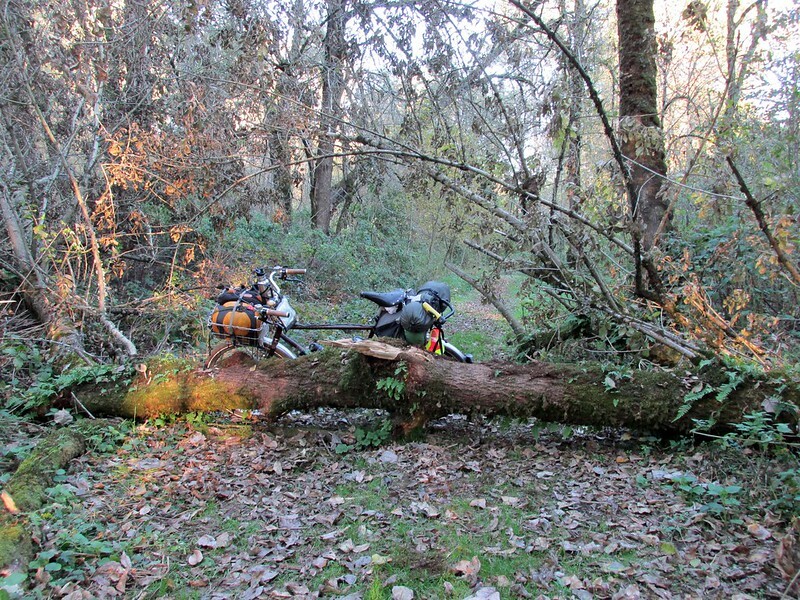 It wasn't too long until I came to a downed tree blocking the path. It's obvious a vehicle hasn't been down this way in some time. And that means the authorities haven't been down here in some time. 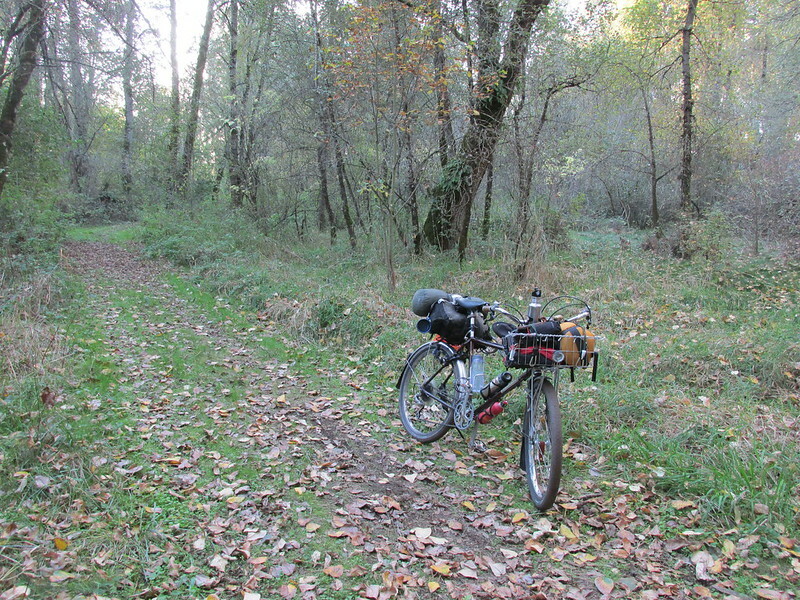 I've often thought of a Bike Overnight trip in some wooded and secluded area of the city. Could this be a good candidate? Then my initial elation deflates. 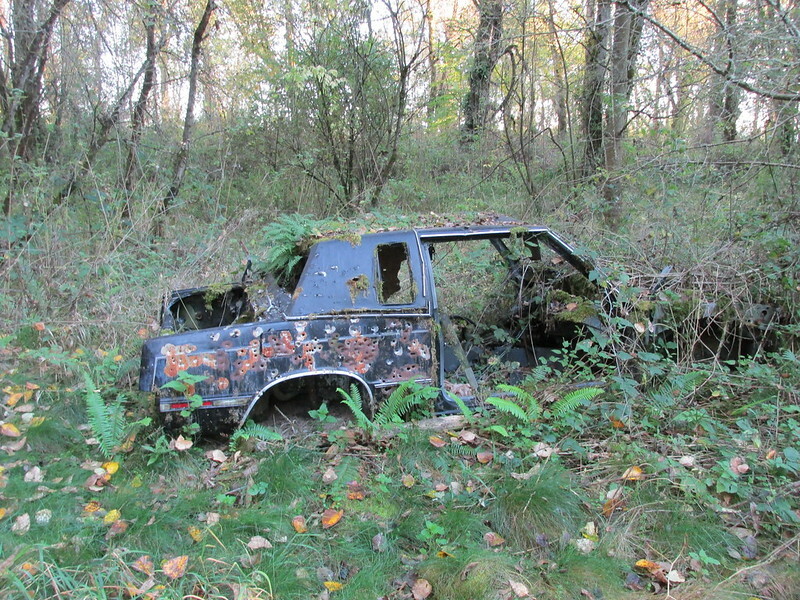 While there hasn't been a running vehicle down here in some time, there is a vehicle. 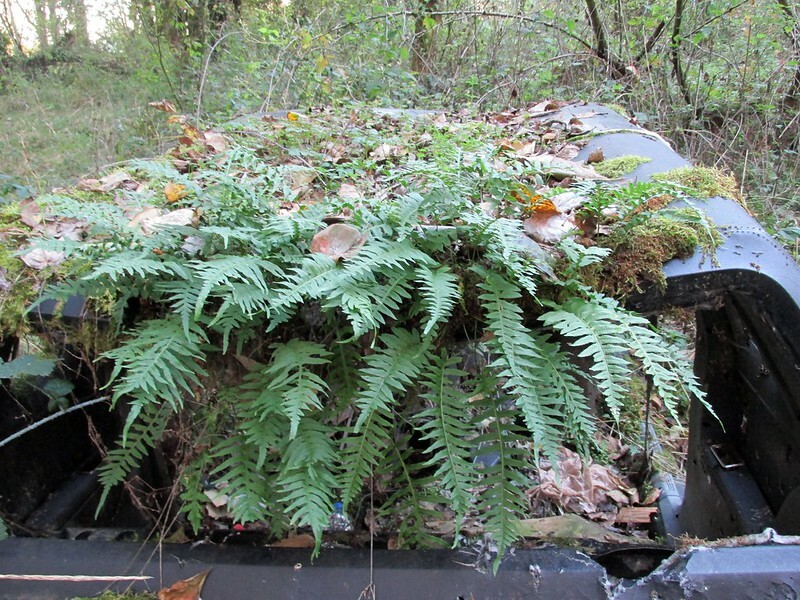 A rotting shell of a vehicle that has been down here for years, noted by the moss and ferns growing from the roof. It looks like a mid-80s GM "G-Body" platform car, like a Olds Cutlass Supreme, or a Buick Regal, which was the second car I ever owned. 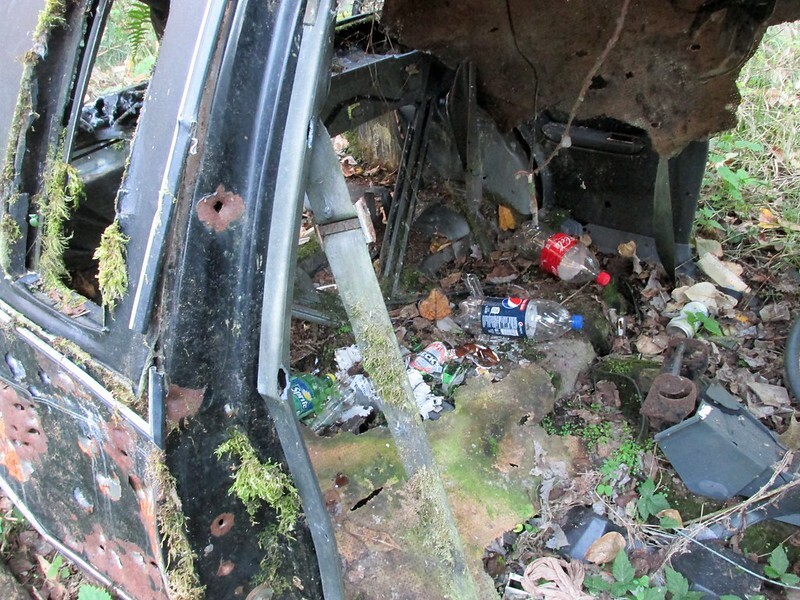 ** The presence of empty bottles inside the car and bullet holes on the side panel says people come down here, and regularly. I rolled onward for maybe a couple hundred feet more. Then I saw in the distance a big blue tarp hanging from trees. An encampment. It didn't surprise me to find this down here. I mean, if I was trying to live "off the grid" in the city and not get harassed by people, far-flung forested tracts like this are the best place. I didn't want to disturb or confront anyone, so I decided to turn back and deal with Airport Way. Maybe another day I'll come back to see what's beyond the bend, but today wasn't the day. And yep, I still got myself some string lights from IKEA. 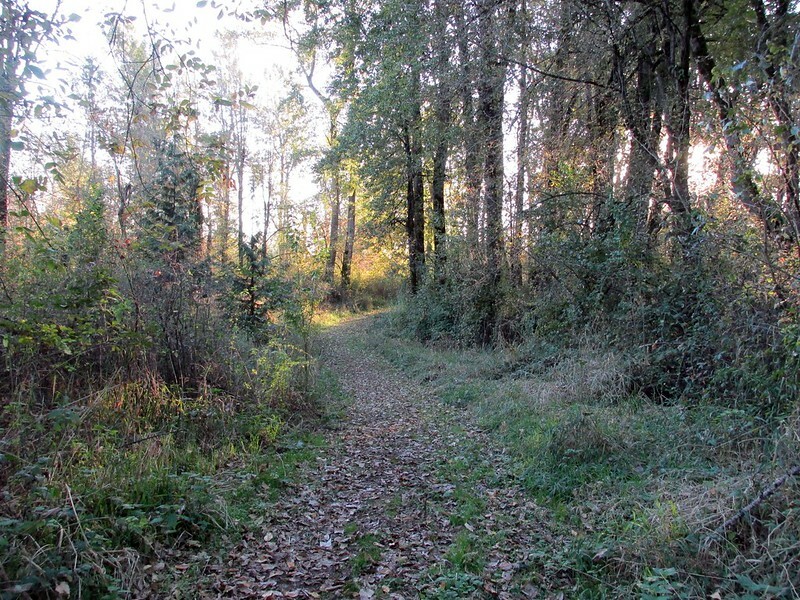 *Man, I didn't realize how long the Wikipedia page on the Columbia Slough has become! **It's hard to think I owned five different cars in my life. All of that over a span of seven years, too.